In this, our final piece for International Women's Day 2015, we look to the future. Three young artists from Gary Crosby OBE's Tomorrow's Warriors' Young Artist Development Programme give us their fresh, forward-looking perspectives: drummer Romarna Campbell, trombonist Rosie Turton and saxophonist Nubya Garcia. I am 19, play the drums and have recently started to play the vibraphone. I am currently studying at Birmingham Conservatoire on the BMus Jazz course, being taught by Andrew Bain, Clark Tracey, Jeff Williams, Mike Williams, Percy Pursglove, Jeremy Price and Hans Koller. 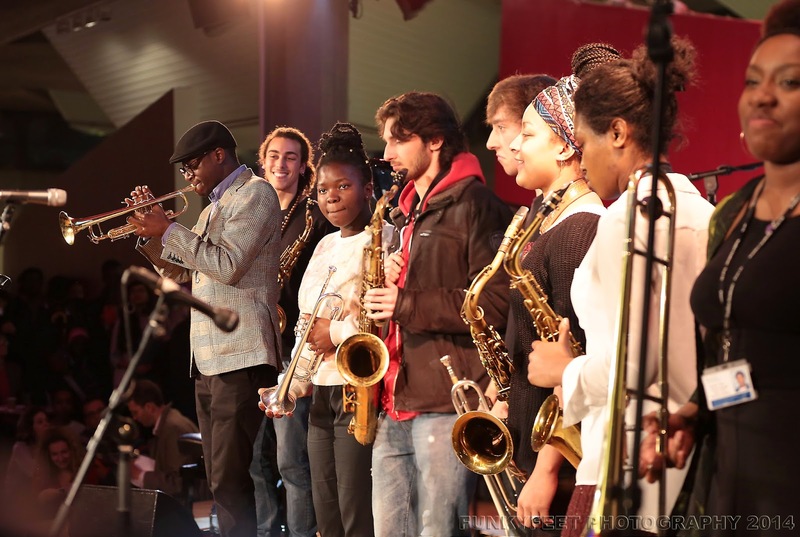 I got into jazz through a chance meeting with Mr Andy Hamilton, a veteran Saxophonist based in Birmingham, who introduced me to a local community Big Band called the Notebenders. I performed regularly with the Notebenders and attended the the Jazzlines sessions at Symphony Hall. This lead to me participating in Birmingham Schools' Jazz Ensemble, occasionally playing in MYJO and then taking part in the Jazzlines education programme. In recent years, I successfully applied to the Junior Department at Birmingham Conservatoire and joined the development programme at Tomorrow's Warriors, having met Gary Crosby in Birmingham. Andy Hamilton was a massive influence in my music and a mentor. I was also lucky enough to receive the expertise of Matt Gough, Jonathan Silk, Andy Bunting and John Fleming whilst a member of the Notebenders. John Ruddick was out music director and mentor at BSJE and MYJO. Gary Crosby has also been a huge influence of more recent times. Other influences and mentors would include Mike Williams, Percy Pursglove, Malcolm Garrett, Jeff Williams, Mary Wakelam-Sloan (Jazzlines) and Nathaniel Facey. I will be celebrating International Women's day by performing in Norway. As for the future, I am currently working on material for both my Sextet and a new project that I started that is for a String Quartet, which will hopefully be ready for performing and more this summer. I am 22, play the trombone (have been playing for about 11/12 years) and am in my final year at Trinity Laban Conservatoire of Music and Dance. I'm currently studying with Mark Bassey, Malcolm Earle-Smith, Jean Toussaint and Julian Siegel. I grew up listening to jazz as my parents had a lot of South African jazz. My first trombone teacher and mentor, John Crouch, ran the local big band (Jazz Vehicle, Lincoln) and encouraged me to get involved. That's how it started. I met Issie Barratt (composer) on the Sound and Music Summer School, she gave me a lot of encouragement. I was on the jazz course at Junior Academy for 2 years when I was 16, and around that same time met and started playing with Tomorrow's Warriors. I went to the Sound and Music Summer school in 2010 and 2011 and National Youth Jazz Collective summer school in 2011. I have my Final coming up at Trinity plus some festivals and gigs in the summer with Nerija, and will be getting my own project on the go soon as well. I am 23 years old, a tenor/soprano saxophonist currently studying at Trinity Laban Consevatoire of Music and Dance on the jazz course. My first experience of jazz was in a small morning youth band run by an incredible musician - Nikki Yeoh, I've been fully inspired by Nikki who encouraged me to come out of my shy shell a bit with improvisation and just go for it! It all started there - I continued through her bands, and Camden Music Service's Youth Jazz Band. I've been involved with Tomorrow's Warriors for the last 4 or so years in various projects; an incredible community of musicians that have helped me improve and have offered great opportunities! As for mentors, I’ve had the opportunity to study with Jean Toussaint for the last couple of years and have just started with Julian Siegel as well as other teachers at College. I went on The Junior Academy Jazz Course, NYJC summer school, Camden Music Service weekend and holiday courses, and the Berklee 5 week Summer Program. This summer I’ll be playing at a few festivals, doing gigs in London and will continue working in some of the bands I am with at the moment (Nérija, Theon Cross Trio, Nubya Garcia/Sheila Maurice- Grey Quintet, Yesa Sikyi, Mimika). I'm trying to write my own music and have future ideas to release an EP under my own name/band. I plan to experiment with adding electronics to my set up. Fantastic! Inspiring hard working young women!